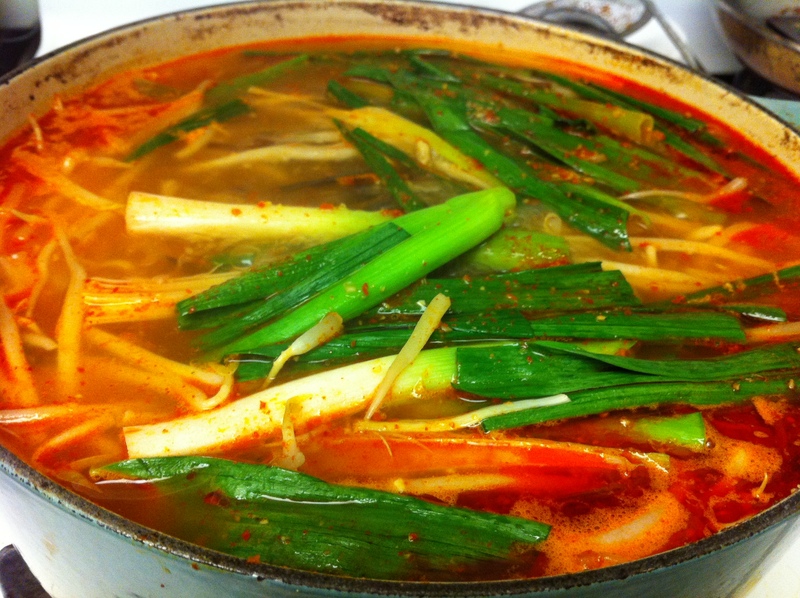 Yukgaejang is a popular hearty, spicy Korean soup served with rice. 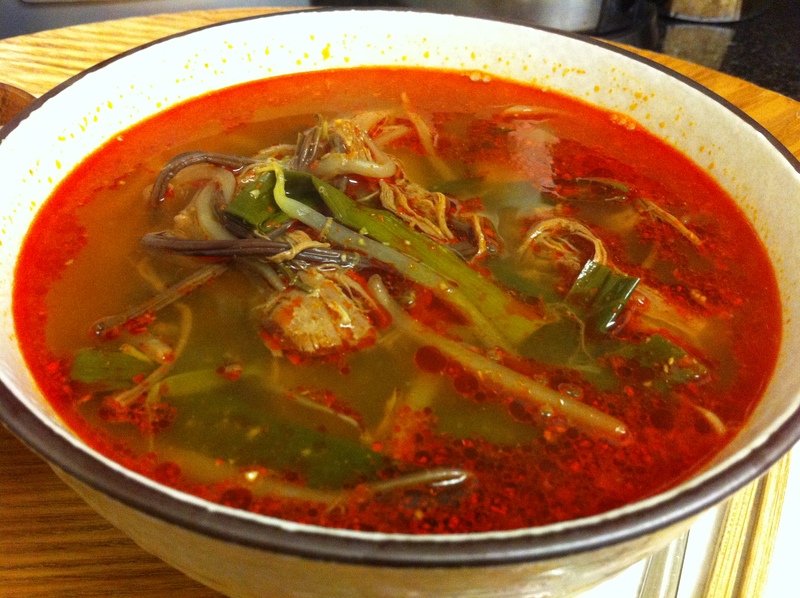 I adore this soup and it is my husband’s family’s favorite, well… except for my husband who doesn’t like spicy foods. Honestly, it is not simple to make but it is not difficult either by any means. My mother used to make this soup when I was growing up and became one of my favorite soups. 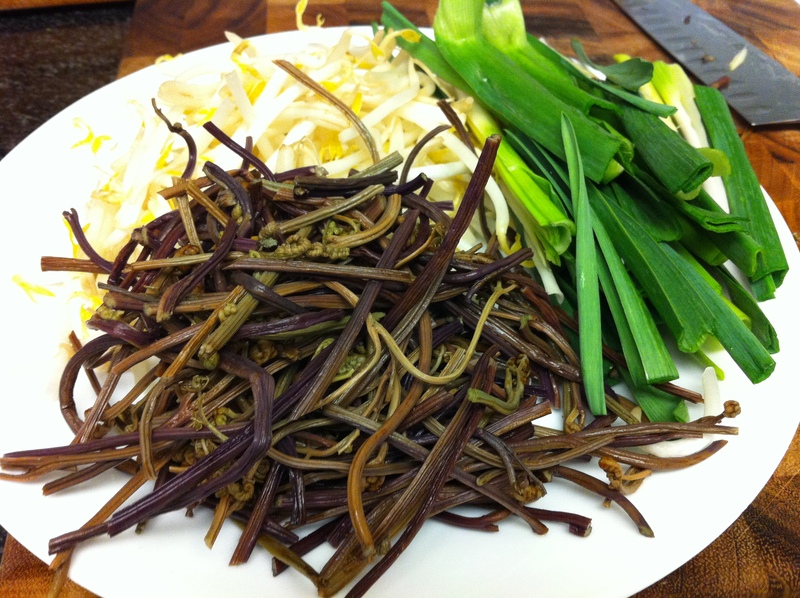 Traditionally, you use gosari (고사리, braken fern) and torandae (토란대, taro stems) along with bean sprouts (숙주나물) and scallions but do not fret if you do not have all these ingredients. It is perfectly fine without gosari and torandae. 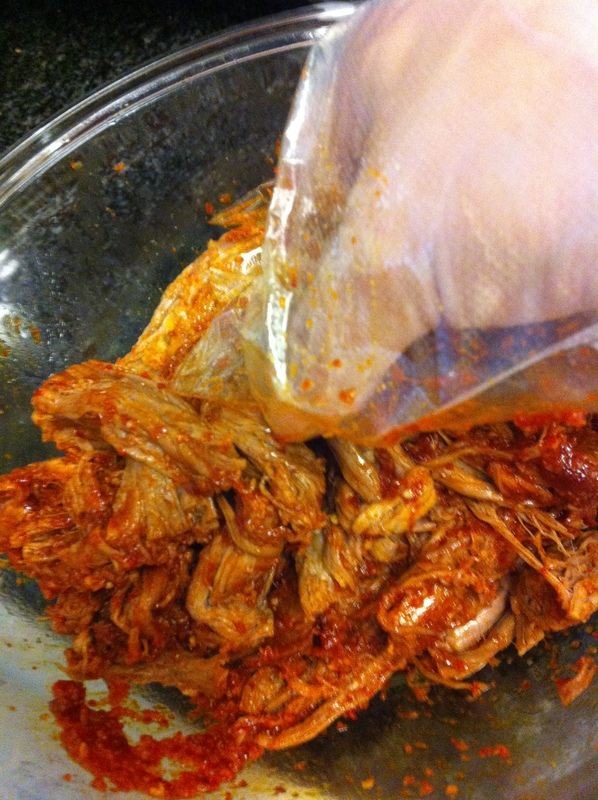 If you do want to use gosari and torandae, you can find them in the dried vegetable section of Korean markets. 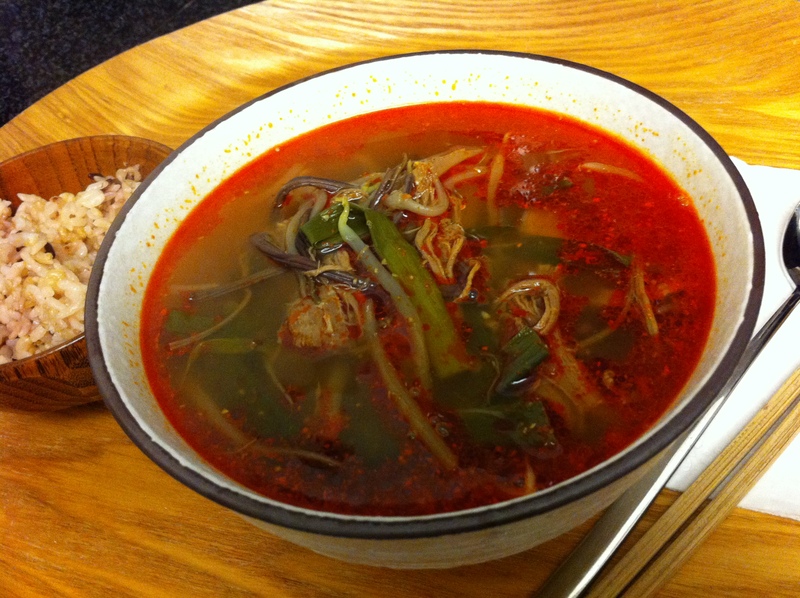 Another option is to add dangmyun (당면, Korean vermicelli noodles). If you do decide to use dangmyun, I suggest cooking the noodles separately so the noodles do not fall apart in the soup if you have leftovers. 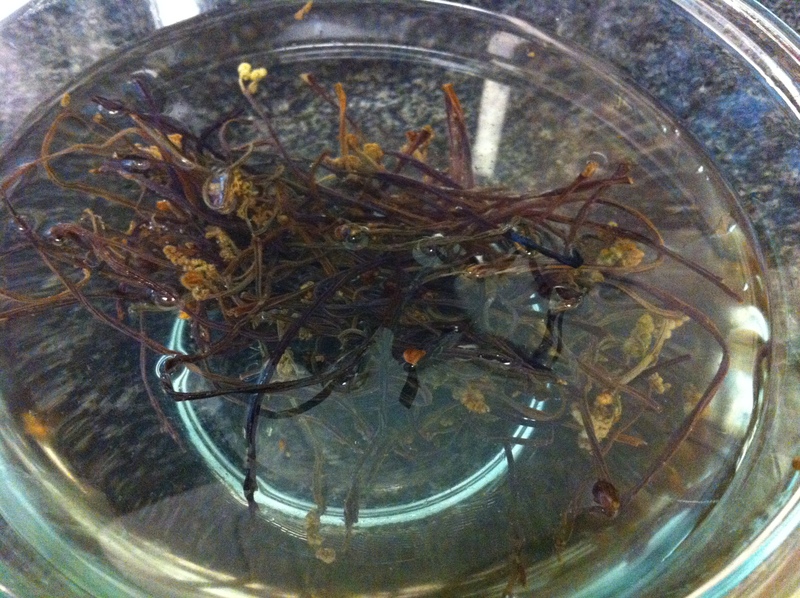 If you are using dried gosari (고사리, braken fern) and torandae (토란대, taro stems), rinse them under cold water and soak them in water overnight or in the morning if you are cooking it in the evening (optional). 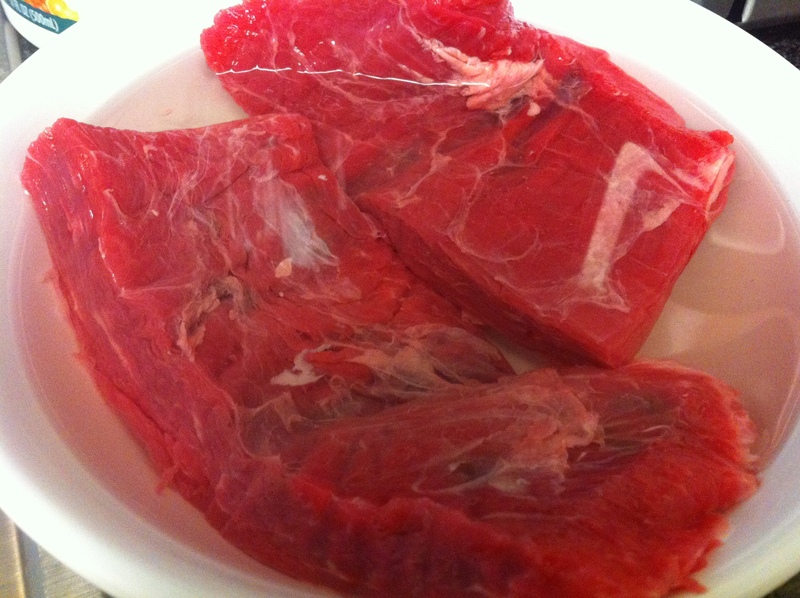 Soak the meat in cold water for about 30 minutes to draw out any remaining blood. In the meantime, combine all the beef marinade ingredients and set it aside. 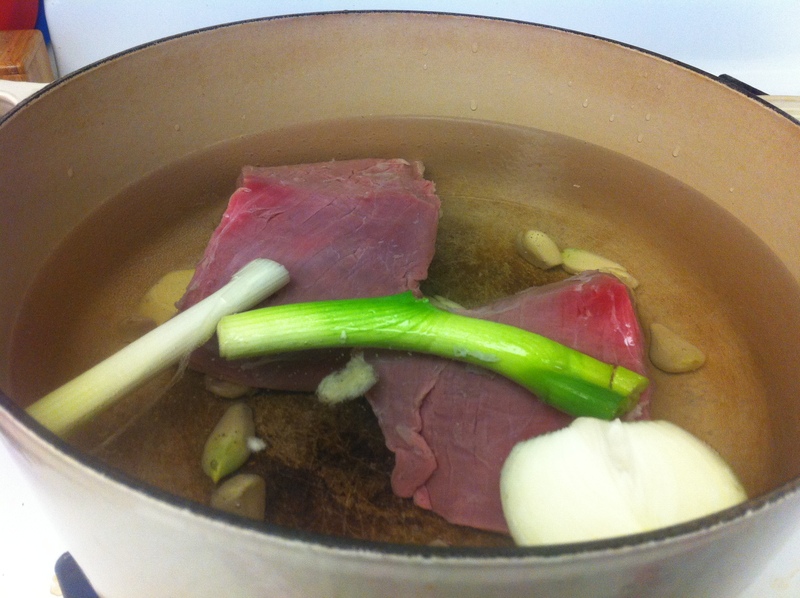 Add the meat in about 10 cups of water with 2-3 white parts of scallions, onion, garlic and ginger. 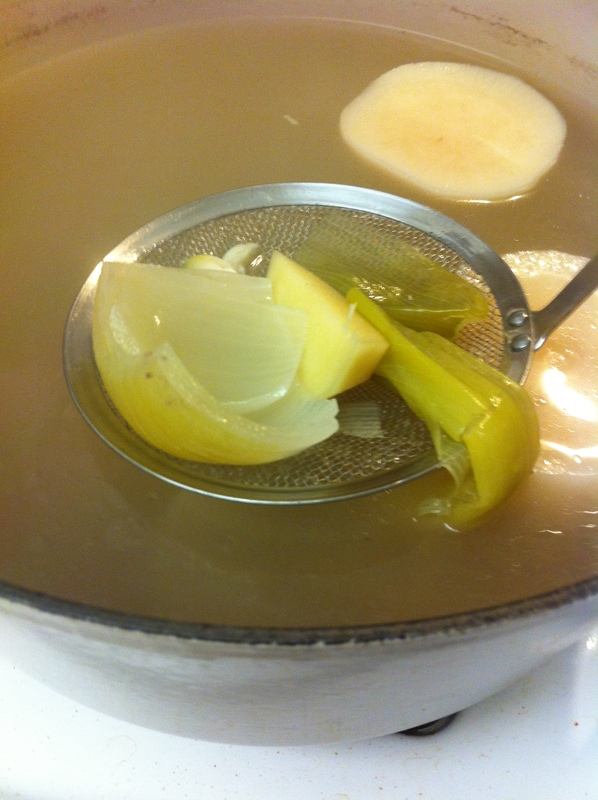 You can also add moo (무, Korean radish) to add more flavor in the stock. Bring it to a boil then simmer for about 2 hours. Clean the remaining vegetables. 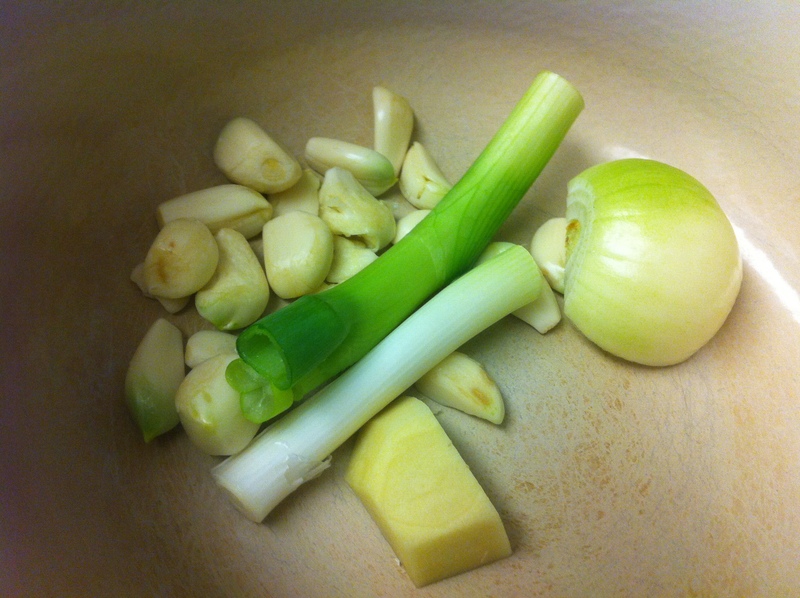 Cut the gosari, torandae and scallions into about 3 inch pieces. 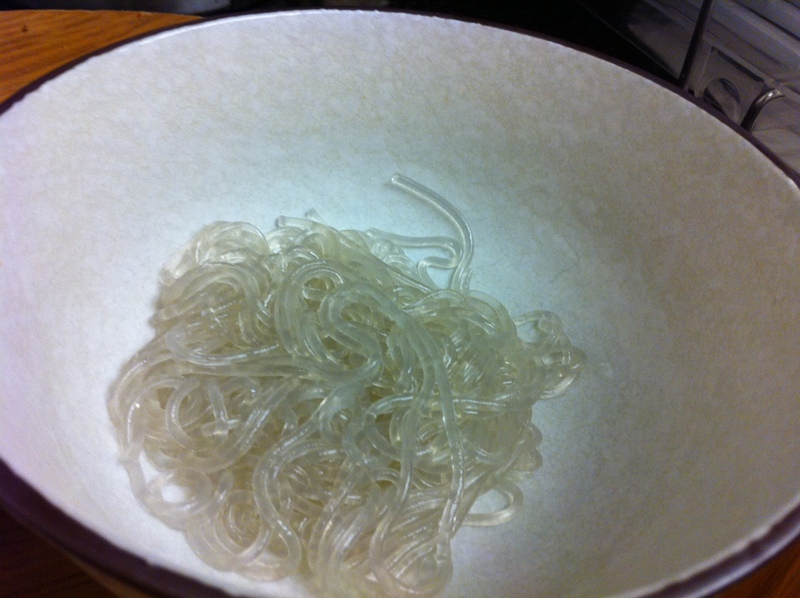 Soak dangmyun (당면, Korean vermicelli noodles) in warm water for about 30 minutes (optional). After the meat has been cooking for about 2 hours, separate the broth and the rest of the ingredients. Set aside the meat and moo. Toss the rest of the vegetables. 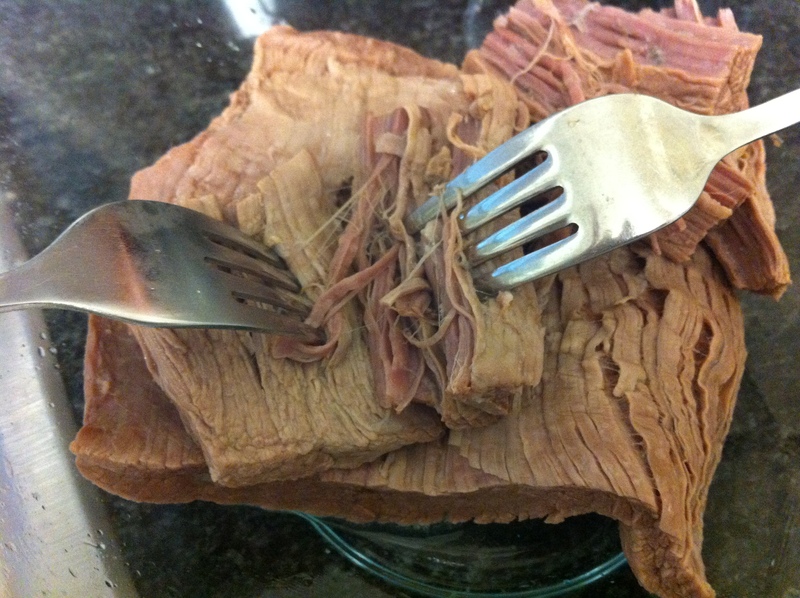 Shred the beef with two forks since the beef will be too hot to handle with your hands. Thinly slice the moo into about 1 inch squares (optional). 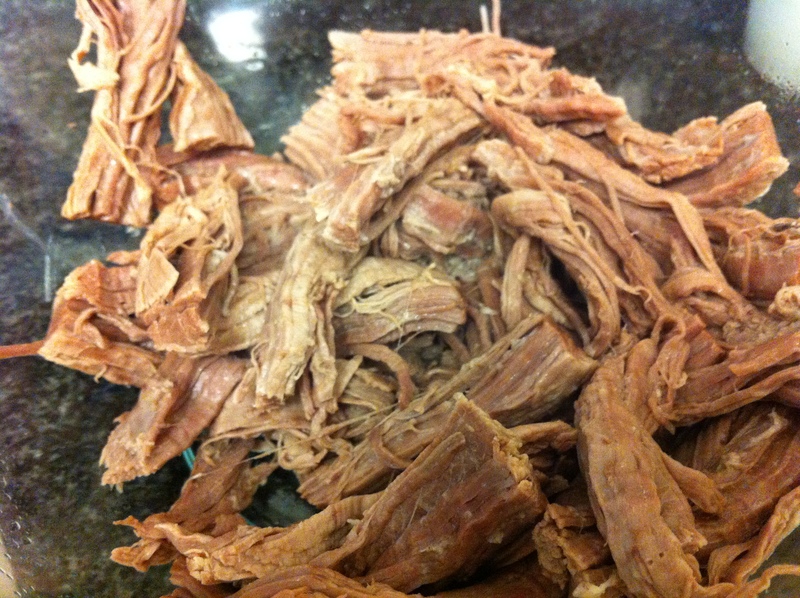 Mix the shredded beef with 3/4 of the beef marinade. Add the shredded beef and all the vegetables cook the soup for about 15-20 minutes. Taste and add the remaining marinade if needed. You can also season the soup with more gukganjang and/or salt. Cook the soaked dangmyun for about 5 minutes in boiling water (optional). Place about 1/2 cup of cooked dangmyun at the bottom of a large soup bowl if you are using dangmyun and pour the soup over it. Serve with rice. This entry was posted in Good for dinner, Good for lunch, Soup/Stew (국/탕/찌게) and tagged Brisket, Flank Steak, Gosari, Torandae by gangnamkitchen. Bookmark the permalink.